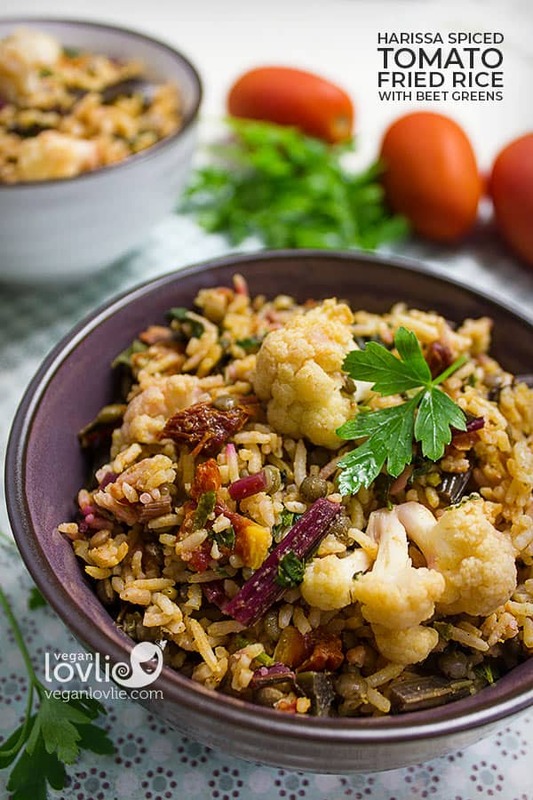 A vegetable tomato fried rice spiced with harissa spice. 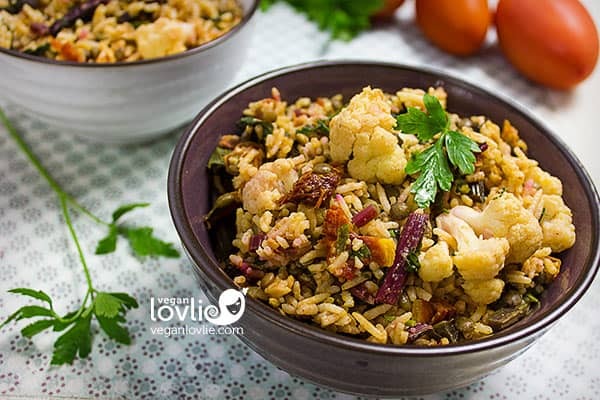 Beet greens and the stems add texture and another depth of flavour to this delicious low-fat rice dish. 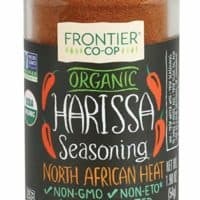 Packed with a blend of hot smoked chili peppers, garlic and other variable spices like cumin, coriander, caraway, mint, sometimes tomatoes and rose petals, harissa is a widely used spice in Northern African and the Middle Eastern cuisines. 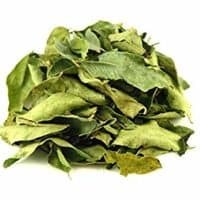 This highly aromatic spice comes more commonly in the form of a paste, although I conveniently keep a powdered version in the pantry. If you love spicy food as much as I do, harissa should be a staple in your pantry too. 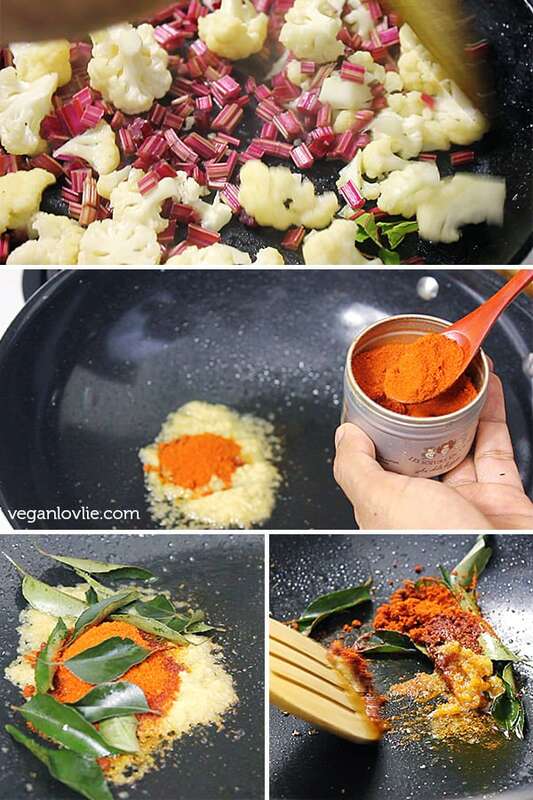 I use it in different sauces and sometimes just sprinkled over some sauteed vegetables. 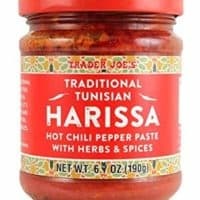 Harissa really is a smack on the tongue, a little is enough; although my love for spicy food beckons me for a more generous amount. I suggest you adjust the amount of harissa used in this recipe to your taste. You can always add a little bit more once you’ve added the rice and tasted it. 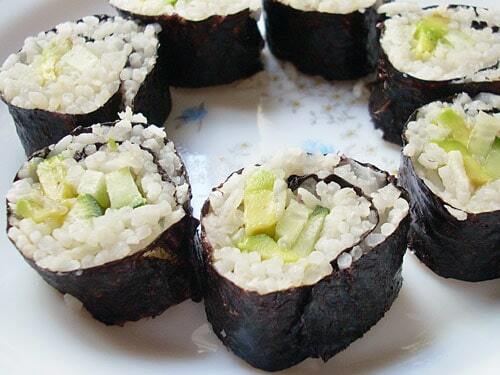 Concerning the rice, it is best to use very cold rice otherwise, the whole dish will turn to a mush. Infact the rice we used was cooked and frozen earlier, we removed it from the freezer about 15 minutes before cooking. You can even add the frozen rice directly to the pan and allow it to defrost until all grains are separated. 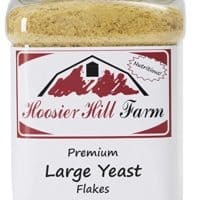 Along with harissa and fresh tomatoes, we have also used nutritional yeast to induce the umami aspect of this taste combination. Whenever I see beets being sold with their greens attach, I don’t miss to buy them. They are really quite a mouthful of flavour and nutrients. To add another depth of flavour and colour to this Middle Eastern inspired fried rice dish, we have used beet greens and the stems. The latter take a little longer to cook, so in this recipe, we are precooking them separately from the greens. 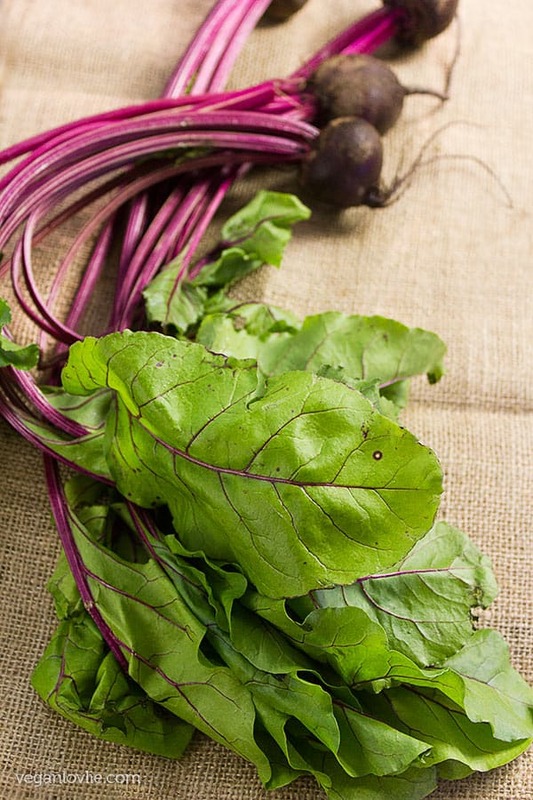 Have you used beet greens in recipes? What are the ways you’ve used it? Last but not least, you get to see Kevin, who is usually behind the camera, in the recipe video as he is demonstrating the cooking process for this delicious Harissa Spiced Tomato Fried Rice. Rinse and drain lentils. Add to a pan with about 3 cups [750 ml] of water and cook covered until lentils are soft but not mushy. Once lentils are cooked, drain them but save the lentil water. We are going to use it later in the recipe. While lentils are cooking, prepare the other ingredients. Rehydrate the sun-dried tomato halves by soaking them in some hot water. Once soft, cut them into small pieces. Leave aside. Wash the beet greens properly to remove all dirt and mud. Arrange the greens properly so that all the stems are aligned on one side. 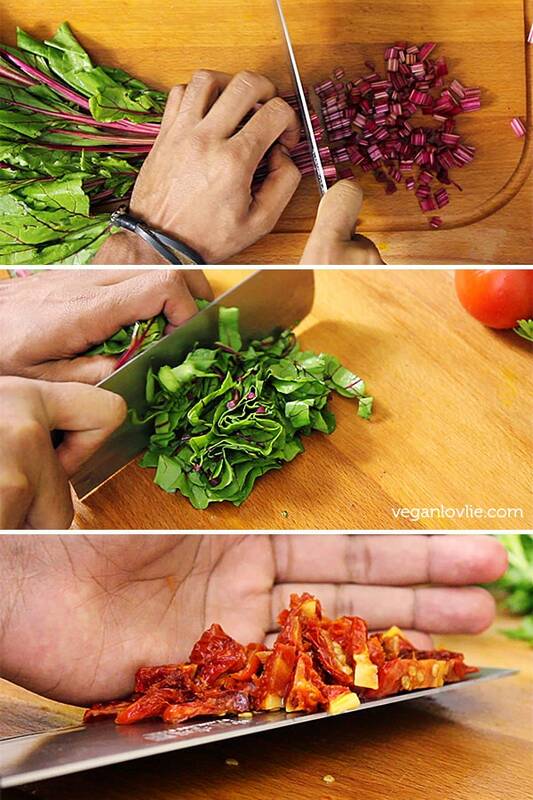 Cut the beet stalks into 1 cm or 1/2 inch pieces until you reach the greens, keep the chopped stalks aside separately. (We are going to cook the stems for a little longer than the greens as they are just a little bit tougher). Continue cutting the beet greens into thin strips. Keep aside. Cut the tomatoes into small cubes. Leave the seeds in as in this recipe it is not necessary to remove them. Start to saute the vegetables. Heat a teaspoon of coconut oil in a skillet on medium-high temperature, add the cauliflower florets along with a pinch of sea salt. Stir and saute for about 4 minutes, then add the beetroot stems. Saute for about 5 more minutes then remove from the heat and set aside. 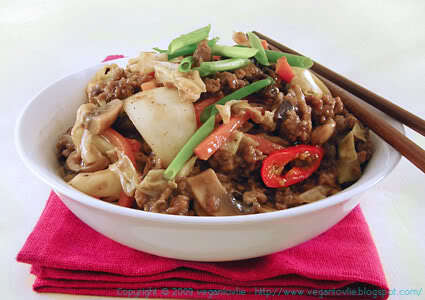 In a wok, on medium-high temperature, add 1 tablespoon of coconut oil and 1 tablespoon of minced ginger. Be careful when you add the ginger as it will instantly start to sizzle and the hot oil may splash on your hand. Add the curry leaves. Roast the spices for about 1 minute then add a little water and continue roasting. Next add the tomatoes. Add 2-3 tablespoons of the lentil water that we saved earlier. Let the tomatoes cook while stirring occasionally until they start to break down. 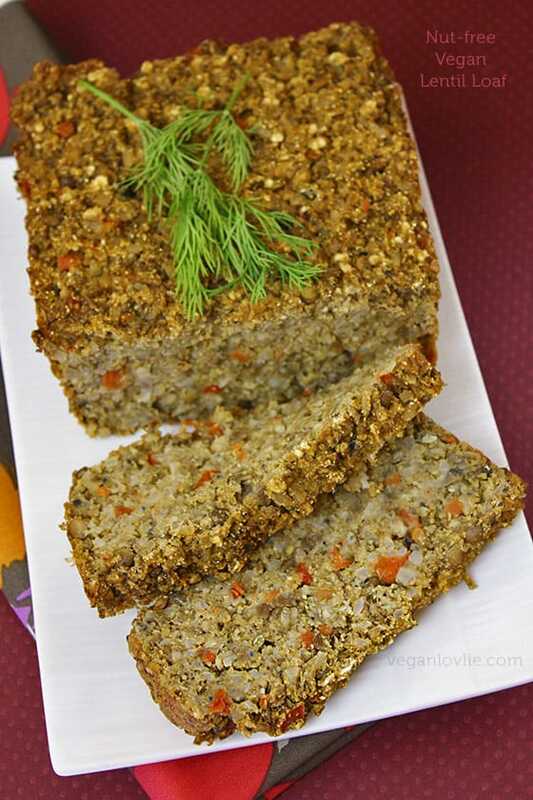 You can save the rest of the lentil water for use in other recipes like sauces or stews. Mash the tomatoes with your cooking spoon to form a paste. Add the sun-dried tomatoes and the nutritional yeast. Stir and cook until you have a thick paste. At this point, add the cooked rice. The rice needs to be very cold. Stir the rice to coat the grains with the spice paste. Once all the tomato paste is well mixed with the rice, add the beet greens followed by the precooked cauliflower and the beet stems. Stir well and then add the cooked lentils. Add some finely chopped fresh parsley and about a teaspoon of fresh lemon juice. Finally add salt to taste. Give everything a final stir and the harissa spiced tomato fried rice is now ready to serve. 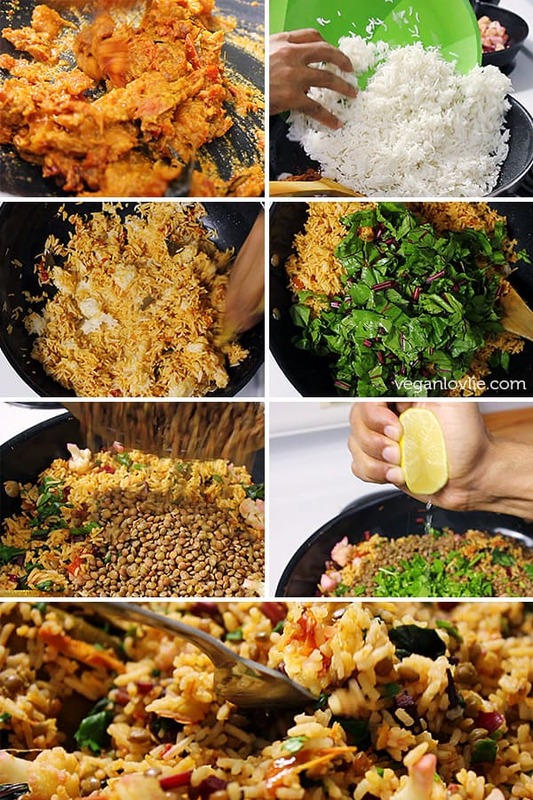 A Middle-Eastern inspired tomato fried rice dish recipe with harissa spice, beet greens and lentils. A great way to use beet greens. As an Amazon Associate and member of other affiliate programs, we earn a small commission from qualifying purchases at no extra cost to you. 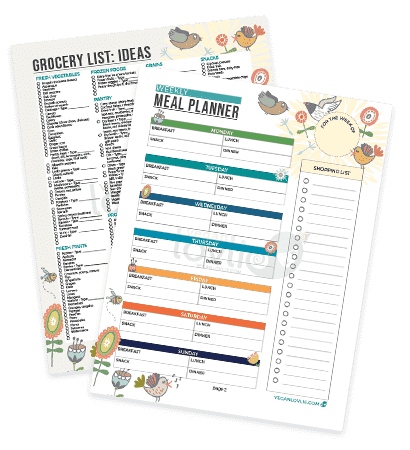 This helps us to maintain this blog and keep providing free recipes for you to access. 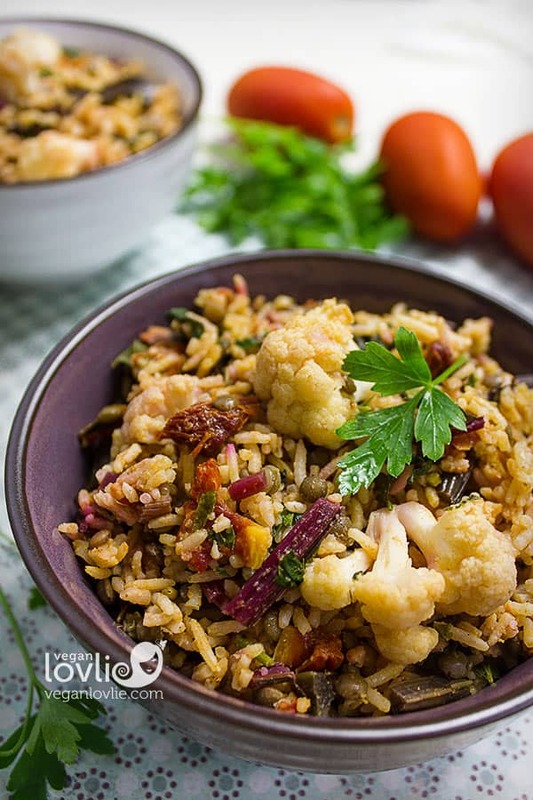 Love this Harissa Spiced Tomato Fried Rice recipe? Pin it for later. Reading this makes my mouth water! I already said it on Instagram, but thank you so much for this recipe! In Germany, beets almost never come with their greens. I am pretty sure nobody knows they are edible.But I told my neighbour, who has a garden. Now she always gives me her greens and I think your recipe is just perfect for them.